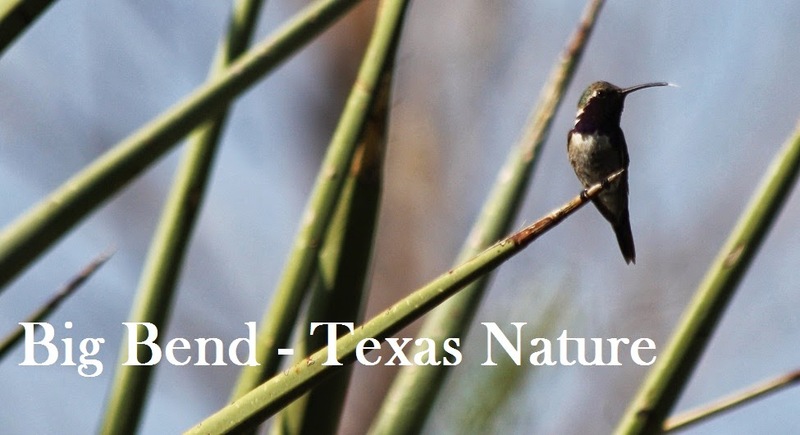 Tom Morris, Tad Finnell and myself just returned from a quick West Texas trip where we had a fantastic time and got most of our target species. We started on Friday afternoon at Carolyn Ohl-Johnson's fantastic Christmas Mountains Oasis where we were treated to several Lucifer Hummingbirds, Black-chinned Hummingbirds, Blue Grosbeaks, House Finches, Painted Buntings and a male Varied Bunting coming to the feeders. It was a rainbow of western bird color! After a few hours there we moved onto Big Bend National Park. We stopped at the picnic area along TX 118 near Elephant Mountain and enjoyed a family of Vermilion Flycatchers, singing Bell's Vireos, and a Cassin's Kingbird (our target for the stop). In Study Butte we stopped at the gas station and had the biggest, cheapest ice cream cones any of us can remember. Excellent on a hot day! In the park we went straight to Panther Junction and then up to The Basin. We only had time to walk around a little bit but we found Scott's Orioles, Black-headed Grosbeaks, Mexican Jays, Cactus Wrens, Rufous-crowned Sparrow, Say's Phoebe, and of course Canyon Towhees. A pair of Say's Phoebes have a nest on top of one of the light fixtures that you can see from the lodge restaurant with three chicks. It was very fun watching them while we were eating. The next morning we started at 5:00 and headed up the Pinnacles Trail. Around 5:40 we heard our first Mexican Whip-poor-will and 10 minutes later, as predicted by Greg Lavaty who we ran into at Carolyn's, several were singing around us at the large pine tree laying along the side of the trail. We hiked on and soon the Black-headed Grosbeaks started singing and then the Mexican Jays moved in clearly looking for a hand out. We did not indulge them. I made that mistake once before and they followed us for miles. Once we got to the switchbacks we started seeing the mountain species. Canyon Wrens singing from the cliff faces, White-throated Swifts and Violet-green Swallows chittering and soaring overhead, Acorn Woodpeckers making their raucous calls. It was great! A Band-tailed Pigeon winged by and a Spotted Towhee zoomed by clearly not happy we were invading his territory. The Cordilleran Flycatchers got going and we found our first Colima Warbler. Somewhere in there we were passed by two hikers, I jokingly said they could find the tanager and have it staked out for us as they passed. We reached the Emory Peak trail about 8:20 and were glad for the level trail onward to Boot Springs. As the boot came into view a Zone-tailed Hawk soared by. More Violet-green Swallows and some Common Ravens. We arrived at The Spot about 9:10 and the hikers were there and indeed had the bird all staked out. Within 10 minutes we had seen the Flame-colored Tanager and a couple young Painted Redstarts. We hung around and saw an adult Painted Redstart and several Blue-throated Hummingbirds, Hutton's Vireo and White-breasted Nuthatches. We also saw the female Western Tanager with the Flame-colored Tanager in tow. Fantastic! We headed back down about 10:30 and got Black-tailed Gnatcatcher and Bushtits on our way down. It was a really great trip and I thank everyone who gave us advice and also the hikers for hanging around until us slow folks could get there to see the birds.